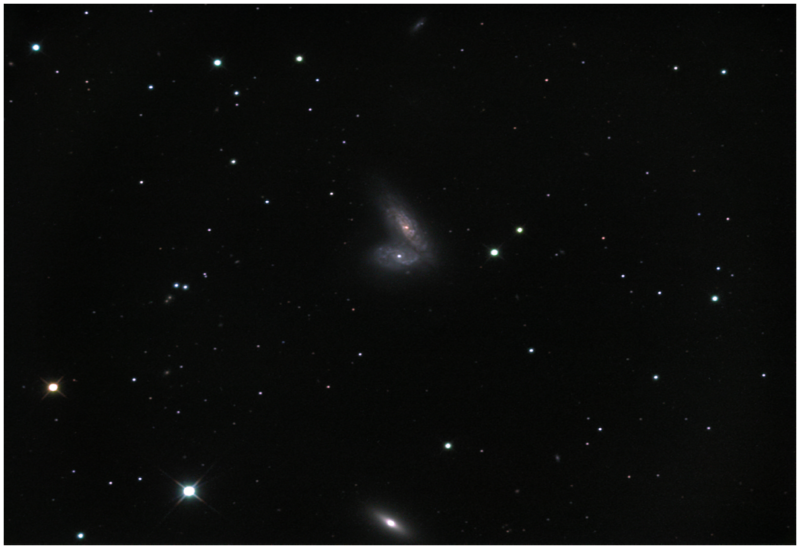 Ngc 4567 and Ngc 4568 galaxies are thought to be in the beginning stages of collision and merger. When galaxies “collide”, they don’t actually impact each other as one might think. Because of the vast distances involved, the gravitational influences will cause the two galaxies to swirl together and eventually combine in to one larger galaxy. Our own Milky Way galaxy is on a collision course with the Andromeda galaxy and one day some billions of years from now a similar event will occur. Video simulation. 180 minutes of Luminance, 1x1 Binning. 120 minutes each of Red, Green and Blue. Image acquired using Apogee A8050 camera with Astrodon filter set through 10” Astro-Tech AT10-RC telescope.